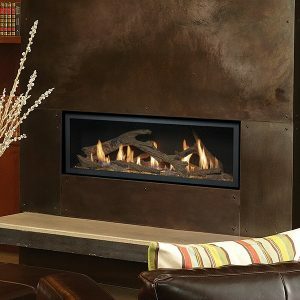 The 4415 HO gas fireplace brings you the very best in home heating and style with its sleek, linear appearance and impressively high heat output. With a long row of dancing flames and built-in fans, the 4415 is not only an excellent heater but a beautiful focal point in your home. Turn on the under-lighting that shines through the translucent glass floor and you’ve got magic whether the fire is on or off. This sophisticated fireplace can accompany any architectural style with a selection of fireback options along with realistic Driftwood and Stone Fyre-Art. The 4415 HO heats up to 2,100 square feet but can heat additional rooms in your home with the optional Power Heat Duct Kit. Burn Rate Range: 21,400-42,000 BTUs/hr.